Greetings! I’m Anders. I do web development and think about data protection. stoppaspionerna.eu: Swedish campaign against data retention. I also do all the technical stuff for Världsbiblioteket, a small library in Stockholm, Sweden focused on non-Western literature. Koha: We were one of the first libraries in Sweden to switch to the free and open source library system Koha. I’m a member of the Swedish Koha User Group’s steering committee. Världslitteratur.se, a Swedish website about non-Western literature. Globalarkivet: Open archive with CC-licensed full-text articles related to global development issues. I spent 2005–2006 studying photography at Kulturama in Stockholm, ran a darkroom with some friends for several years, and exhibited a couple of times. But I never got around to setting up a proper website for my pictures. I’ve posted photos irregularly to minorshadows.net since 2008; it’s my personal photo journal, of sorts. For a while I took a whole lot of photos at gigs, and from 2005 I uploaded some of them to Wikimedia Commons, setting them free. Many of them have been in active use on Wikipedia for 10+ years now (e.g., Andrew Bird, Sonic Youth, Arcade Fire). Présentation du Club d’utilisateurs Koha de Suède, Association KohaLa Symposium 2018, Paris, France, 2018-06-26. Privatliv och webben – att göra vad som krävs, Internetdagarna, Stockholm, Sweden, 2016-11-22. Privacy and the Web – are you doing what it takes?, NightlyBuild 2016, Cologne, Germany, 2016-09-02. With Amelia Andersdotter. Privacy and the Web – to boldly go where no one has gone before…, IFIP Summer School 2016, Karlstad, Sweden, 2016-08-22. With Amelia Andersdotter. Privacy and the Web – are you doing what it takes?, WordCamp Europe, Vienna, Austria, 2016-06-25. With Amelia Andersdotter. Privatliv och webben – att göra vad som krävs, Fripost, Gothenburg, Sweden, 2016-06-11. With Amelia Andersdotter. Unsafe Harbors: Data Protection Strikes Back, WordCamp Nuremberg, Germany, 2016-04-16. With Amelia Andersdotter. Unsafe Harbors: Data Protection Strikes Back, WordCamp Norway, Oslo, Norway, 2016-02-20. With Amelia Andersdotter. Data protection for websites made simple, FSCONS 2015, Gothenburg, Sweden, 2015-11-08. With Amelia Andersdotter. Data protection in web development made easy, DrupalCamp Baltics, Tallinn, Estonia, 2015-08-28. With Amelia Andersdotter. Dataskydd och rätten till självbestämmande, Stockholm Anarchist Book Fair, Stockholm, Sweden, 2015-08-22. With Amelia Andersdotter. Building Privacy-Friendly Websites, WordCamp Europe, Seville, Spain, 2015-06-27. With Amelia Andersdotter. Andersdotter, A., Jensen-Urstad, A., 2016. Evaluating Websites and Their Adherence to Data Protection Principles: Tools and Experiences. In Privacy and Identity Management. Facing up to Next Steps: 11th IFIP International Summer School, Revised Selected Papers, pp. 39-51. Springer International Publishing. Final publication. Circa 1999–2006 I ran a succession of news/article/forum websites: LinuxQuake.se, LinuxSweden.nu and UNIXSweden.net, which finally became Unix.se, which became a wiki in its final form. There’s a static copy from 2006. 2000–2010 I was system administrator for FragZone, later just FZ.se, Sweden’s oldest and biggest gaming site (still alive and kicking after 20 years). I was also contributing editor during a few periods. 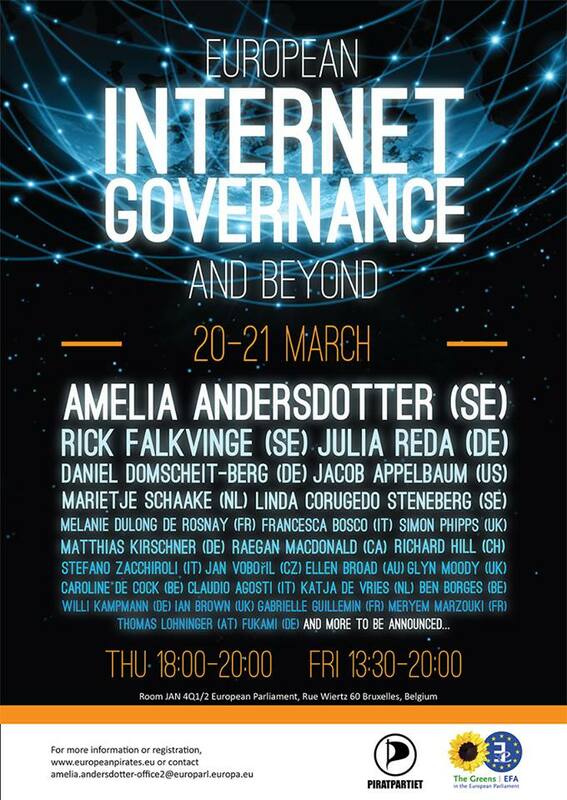 During my time as a professional pirate in the European Parliament I was head organizer of European Internet Governance and Beyond on March 20–21 2014, a conference held inside the parliament in Brussels, where I had the great fortune of being able to invite a ton of incredible people; check out the videos.